In its recently published report titled “Combination Antibody Therapy Market: Global Industry Analysis and Forecast, 2016-2024,” Persistence Market Research reviews the global combination antibody therapy market for an eight year forecast period (2016 – 2024). This research report provides a detailed analysis of the global combination antibody therapy market while identifying the factors contributing to the growth of the market across the key assessed regions. This study offers insights into the dynamics and trends of various regional markets that are influencing the current nature and future dynamics of the global combination antibody therapy market during the forecast period. The report includes an analysis of the global combination antibody therapy market on the basis of applications of combination antibody therapy. It provides a market outlook for 2016–2024 and sets the forecast within the context of the combination antibody therapy markets across different regions. This study discusses the market share of each of the segments in the overall global combination antibody therapy market. In order to meet the new combinations to treat cancer diseases, manufacturers and new players in the market are investing in R&D initiatives to develop and launch new and innovative products. A detailed analysis by each combination type further empowers clients to formulate strategies for every stage of their business. The report begins with Y-o-Y growth and anticipated growth projections of the global combination antibody therapy market. 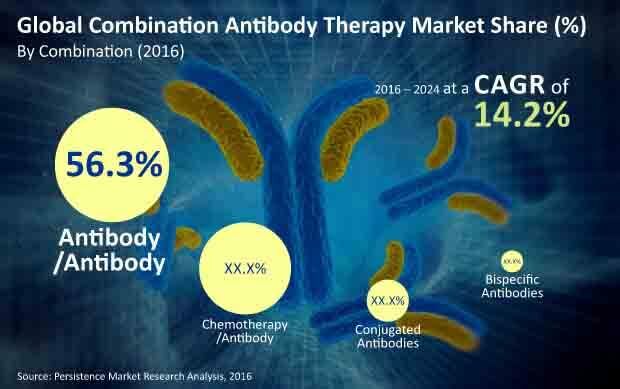 It further covers market overview including definition and different applications of the global combination antibody therapy market. The report also examines the market taxonomy in this section where the global combination antibody therapy market is segmented on the basis of combination, application, end user and region. The focal point of the report is on market opportunities, pricing forecast, supply routes, and information on logistic providers operating in the global combination antibody therapy market. Persistence Market Research analysts have also studied the historical trends, combination antibody therapy market growth rate, the financial performance of top companies, raw material production trend and raw material price trend pertaining to the global combination antibody therapy market. The major countries GDP and healthcare spending analysis is also taken into consideration while forecasting the global combination antibody therapy market performance. The last section of the report covers the competitive landscape that provides a dashboard view of companies that manufacture and provide services in the global combination antibody therapy market. The report provides company profiles of some of the key players and a strategic overview of mergers and acquisitions along with their expansion plans in various regions. Persistence Market Research has adopted a systematic research approach while drafting the report on the global combination antibody therapy market. In-depth secondary research has been utilized to ascertain overall market size, top industry players, top products and industry associations. Data is validated by the triangulation method, wherein secondary and primary research and Persistence Market Research analysis contribute to the final data. Inputs have also been taken from country wise manufacturers through secondary and primary sources as well as inputs from governmental bodies. Yearly change in inflation rate has not been considered while forecasting market numbers. Instead, product-wise weighted Average Selling Price (ASP) has been considered to deduce market values. Further, confounding factors influencing pricing have not been considered in the pricing forecast while drafting this report. The top-down approach has been used to assess market numbers for each product category, while bottom-up approach has been used to counter validate the market estimations. Persistence Market Research analysts have excluded regional average profitability margins from the estimated data collected from distributors. According to the report, revenue contribution of the chemotherapy/antibody segment to the global combination antibody therapy market was estimated to be close to 40% market share by 2016 end. The chemotherapy/antibody segment is anticipated to exhibit a CAGR of 7.8% in terms of value over the assessed period. This segment is estimated to be valued close to US$ 35 Bn by 2024. The first and foremost reason for fueling the growth of the chemotherapy/antibody segment is the rise in the rates of cancer across the globe. Cancer is the second leading cause of death globally after cardiovascular disease. The proportion of deaths around the world due to cancer has increased remarkably in the last few years. According to the World Health Organization (WHO), cancer accounts for more than 8 million deaths each year, with about 70% new cancer cases expected to be reported over the next 20 years. Each cancer type requires a unique treatment and chemotherapy is one of them. Hence, increasing prevalence of cancer and the need for chemotherapy that is capable of attacking cancer cells throughout the body is driving the growth of the chemotherapy/antibody segment of the global combination antibody therapy market. Another factor which is creating robust development in the chemotherapy/antibody segment is that combination antibody therapies are more effective than traditional therapies such as radiation or surgery. Radiation therapy and surgery can remove, damage or kill cancer cells in a particular area; however, combination antibody therapy such as chemotherapy/antibody can work throughout the body. The effectiveness of combination antibody therapy is creating a positive impact on the chemotherapy/antibody segment. An increasing awareness regarding the treatment options for cancer among people is also fueling the growth of the chemotherapy/antibody segment. The chemotherapy/antibody segment in the North America region was estimated to be valued at US$ 8,851.1 Mn by 2016 end and is expected to reach US$ 13,951.3 Mn by 2024. The chemotherapy/antibody segment in the North America combination antibody therapy market is expected to increase 1.6X in terms of revenue during the forecast period. While in Latin America and APAC regions the market share of the chemotherapy/antibody segment is more than 40%. In the APAC region, the chemotherapy/antibody segment was estimated to be valued at more than US$ 2,000 Mn by 2016 end and is expected to reach close to US$ 6000 Mn by 2024. The chemotherapy/antibody segment in the APAC combination antibody therapy market is expected to increase 2.1X in terms of revenue during the forecast period. In 2008, U.S. based company Biogen Inc. announced the successful phase III clinical trials of Rituxan. In combination with chemotherapy, this drug helped improve progression free survival in patients with relapsed chronic Lymphocytic Leukemia. In 2010, the FDA approved Rituxan in combination with chemotherapy drugs such as fladarabinie and cyclophosphamide (FC) for the treatment of the most common type of Adult Leukemia. The top 10 key players operating in the global combination antibody therapy market collectively contribute approximately 80% revenue share to the global combination antibody therapy market. The remaining players contribute approximately 20% revenue share to the global combination antibody therapy market.